Perhaps you are using bathroom blinds purely to cover up a window and you do not necessarily want to draw attention to it. However, when the window is positioned above a beautiful tub or is a big expanse of window where you want to use blinds, you need to incorporate them into your overall bathroom design. 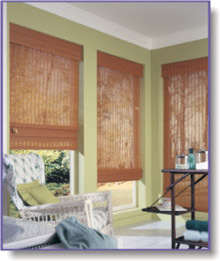 Bathroom shutters and blinds all come with standard functional control rods or cords. You can add your own though! A rough hemp cord and tassel with wooden trim goes perfectly with wooden bathroom blinds. They were simply tied to the existing cords which do not hamper functionality. Be bold in your choice of accent. If you want attention, a wispy colored cord is not going to do the trick. The repetition and area covered by the standard bamboo blinds become a design element in themselves. 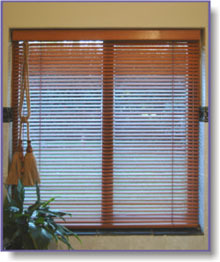 Although a bit more expensive, having the blinds made to measure is well worth it - they just look the part. Bathroom blinds are perfectly suited to contemporary bathrooms. A big picture window can be entirely dressed with minimalist white blinds. 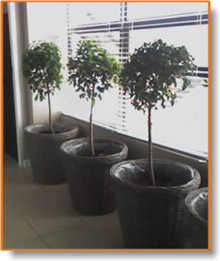 Adding a row of standard potted plants is in perfect rhythm with the slatted blinds. Note: rather than shiny ceramic pots, woven basket pots were used to add a different texture. Standard, off the shelf blinds were used to dress a corner window. If you cannot find the full length blind for your bathroom windows, having them half drawn will hide the fact. This bathroom is upstairs and has frosted windows, so the bathroom blinds are purely decorative and are not needed for privacy. Have a look at other Bathroom Windows where no window dressing is necessary. There is no rule that says your bathroom blinds must fit snugly in the window opening. You can choose to alter their size purposely to make a small window seem bigger or draw the eye upwards. Or perhaps you just want to use them as a feature and fit a floor to ceiling panel. There are many more ingenious ways that you can use to add dimension to your bathroom blinds, whether custom made or not. Combine them with your bathroom window curtains. 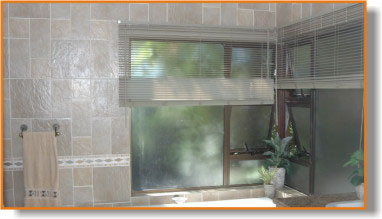 More bathroom window treatments and pictures of bathroom curtains. Choose the right type of bathroom blinds for your bathroom theme: for example aluminum blinds will work perfectly in a modern bathroom whilst white painted wooden blinds or shutters will suit a country style bathroom. Think about the dimensions of the blinds - do you have to fit them to the window size?